When Elizabeth Ann (Betty) Bloomer was born in Chicago on April 8,1918, did her parents, brothers and the rest of the world know how this truly remarkable individual was going to affect the lives of millions. Betty began her exceptional trek through life in Grand Rapids, Michigan. At an early age she developed a passion for dance. She developed her own dance company working with handicapped children teaching them the value of rhythm and movement. Her humanitarian spirit began early. Gerald R. Ford and Betty married on October 15, 1948, two weeks before he was elected to the U.S. Congress. For most of the 25 years of their Congressional career the Fords lived in Alexandria, Virginia, where their children, Michael, John, Steven and Susan were raised. During this time Betty Ford was a good 'soccer mom' and an astute student of women involved in the political system. Fortunately, she was prepared for the unexpected. Just as the Fords were planning on retiring from Congress, Gerald Ford, then minority leader, was selected on December 6, 1973, to serve as Vice President of the United States. Eighteen months later, on August 9, 1974, he was sworn in as the 38th President of the United States. The Fords moved to the White House. As First Lady, Betty Ford, directed her artistic and humanitarian spirit to continue her work with handicapped children and her knowledge about women's issues to help others. In fact, she was very involved in working toward the passage of the Equal Rights Amendment. However, the conscience of a nation was raised when First Lady Betty Ford, who had been diagnosed with breast cancer, became an honest and vocal advocate for increased awareness about this and other women's health issues. Mrs. Ford helped millions to understand their illness and take personal responsibility for their bodies. In her second book, published in 1987, BETTY: A GLAD AWAKENING, Mrs. Ford recounts her own recovery from chemical dependency in 1978. Again, she helped millions to understand their illness and to take personal responsibility for their bodies. Then in 1982, Mrs. Ford and Leonard Firestone co-founded The Betty Ford Center in Rancho Mirage, California, to assist women, men and their families in the starting process of recovery from alcohol and drug addiction. Today, it is regarded as the premier treatment facility in the nation. Betty Ford's legacy is abundant and active. She defies the rules and talks openly and acts assertively. She has been honored many times by many prestigious groups, but her greatest honor comes from within. Her gift for giving is legendary, her outreach powerful, her honesty unparalleled. As a nation we have been made more fortunate to have had benefit of a remarkable First Lady. 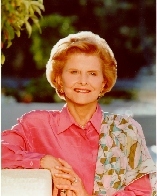 Women's International Center is privileged to acknowledge Betty Ford with the 1998 Living Legacy Award and to thank her for being a good friend to millions.